1. What is your favorite breakfast pastry? I can’t say I’m a huge fan of pastries. They just don’t do anything for me and don’t tempt me in the least. I want to say my favorite pastry would be a muffin. Is a muffin considered a pastry? The double chocolate ones are the best, though! 2. Were you ever in a Thanksgiving or Christmas play? Yes, I was in a production when I was 12 with the girls group I attended every Wednesday night. I played a shepherd, I believe, and really wanted to sing a solo but was too shy to audition. It was fun, though! And I think I still have a video of it. I have also been in multiple Christmas concerts when I was in elementary and middle school. 3. What is your favorite clothing accessory? Can I be boring and say undershirts? I only have a white cami and a black cami but I love them and usually need to buy new ones every 3 months or so. (I’m badly in need of new ones. Hint hint, Santa Claus.) I just have a problem with wearing only shirts with nothing next to my skin. It makes me feel uncomfortable so 90% of the time, I’m wearing a cami. 4. What is your favorite item of clothing? Hm…I’m not sure if cami’s fall under accessories or not, but I’m keeping my answer up there because it makes more sense to me! I don’t know what my favorite item of clothing is. I like jeans and have a great pair of comfortable jeans that I wear 4+ times a week. I love skirts, but don’t wear them nearly enough. I love capri’s because they’re the perfect length for me and I don’t have to deal with rolling up the bottoms. I love shirts, especially ones that I feel comfortable in. I just love clothes! 5. What is your favorite color and why? Turquoise. I just fell in love with this color a few years ago and every time I see it, whether it’s the color of a shirt or on a web page or anywhere, I get insanely happy. It’s such a pretty color! 6. What is your favorite type of Christmas cookie? I make some yummy M&M and chocolate chip cookies during the holiday season. I use the Nestle Tollhouse recipe, adding in Christmas-colored M&M’s and plenty of chocolate chips and those cookies are to die for! I probably make 5 or 6 batches in a 3 month span so after the Super Bowl, I stay away until next Thanksgiving! 7. What is your favorite scent (food, perfume/lotion)? Oh, the smell of freshly baked cookies. Real Christmas trees. Men’s cologne. A baby’s soft cheek. Gas. I have a lot of favorite scents. 8. What is your favorite household cleaner? My mom would laugh at this question. (Stephany? Do housework? HA!) This is easy: the little dishwasher cubes! Oh, the dishwasher. The only good that came from my mom’s accident: she now uses it religiously! She’s a believer! It’s just so much easier (and cleaner!) to rinse out our dishes, stick ’em in the dishwasher, wait ’til it’s full, and let it wash itself. I would credit the dishwasher as the most amazing invention in the kitchen. 9. When you were a kid, what did you want to be when you grew up? And what did you actually grow up to be? What did I grow up to be? Good question. I started college with an education major and I’m now a journalism major, with no desire to use that degree for journalism. There is not one bone in my body that wants to be a reporter. I have no idea what I want to do when I graduate. None whatsoever. I’m not even sure I want to become an author anymore. 10. What is the last song or album you bought? I actually just bought a bunch of songs off iTunes last week to give me a new playlist for my runs and I’m in love with some of the songs I bought, most especially Love by Jaeson Ma which is a chilling song that makes me tear up every time I hear it. If you haven’t heard this song, you need to. I promise you won’t regret it. I'm not a hug fan of breakfast pastries either. I do like muffins, though, if they're considered a pastry. I'm always wearing a tank top/cami under my shirts. I feel awkward when I don't. Annnnd I love the dishwasher! Okay topic but I was the moon in a play called "The Scarecrow and the Moon." How awesome am I? Is a donut a pastry? That's my fave! That was supposed to be…OFF topic…wow, some day's my fingers just can't type what my brain is thining! I'm pretty sure my mouth just watered at the picture of that muffin/cupcake chocolate delicious thing at the top of your blog. That actually looks sooo yummy haha. I also like the smell of gasoline. Glad I'm not alone in that! Loved reading your answers to the questions. Oh, and camis? Yeah, i can't get enough of them either. I wear them often as well under cardigans and sweaters and they get so frayed/worn/torn so quickly! I need to buy more too but I can't ever find quality ones that aren't reasonably priced. I was shopping with my sister this weekend and she picked up a ton of camis ($4) each. She wears them under every shirt. Is that common? I may have to ask on my blog. Hmm. I am not a pastry person either, or coffee, coca-cola…yes ma'am!! Yummm, breakfast pastries. Cheese Danishes are my favorite! I also love camis. I have so many of them. Do you ever get them at Target? They are really inexpensive there! 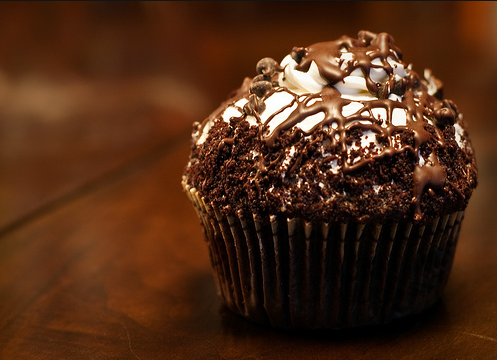 Thanks to you, I now need a cupcake.